I didn’t think I’d be able to do this. On the window ledge in my bedroom is a translucent glass vase. It has a bunch of very beautiful peonies in it, artificial but lifelike and nice to gaze at when I’m resting in bed. I particularly love watching it as the light outside fades at the end of the afternoon and the glow from the street lamps slowly collects in the glass, as if in some magical way light is drawn into it and then trapped there. I thought I’d try drawing on my smartphone while lying down – just to see if I could – and to my surprise I soon realised that this is one very compelling reason to use a drawing app. Even on very small screen (I have the smallest smartphone on the market) I managed to draw most of what I wanted. I just had to cut off the tops of the peonies. And I could never have done this on paper or in a sketchbook from my resting position on the bed. When I started playing with digital drawing I didn’t think I’d be likely to take it seriously but somehow I can’t put it aside, and I’m not sure why. I need to get more comfortable with it, and faster too; but even at this stage I can see some of the advantages. I also need to avoid some of the pitfalls, one of which is the relative ease of making images that are pretty and slick but not honest, not really well seen. An easy trap to fall into. But it’s going to be fun grappling with this, and that’s important; having fun is good. This post is part of a series in the Draw More Project – an investigation into what drawing means to me, what it can do, and why it’s important. It’s a practice, an exercise, and a journey of discovery all rolled into one. I’ve been looking at different apps for sketching and painting on a tablet, and it’s a pretty confusing thing for someone like me who trained long before anyone had computers in the home or studio, and digital artwork was unknown. I was at Goldsmiths’ College in the 1970’s. This obviously wasn’t my only source of learning and I’ve been adding to my understanding of materials and techniques ever since – adding things like printmaking and silversmithing through courses and workshops – but I’ve never had the chance to learn things like photo editing, and until I recently got a tablet and a smartphone, I’d never tried digital drawing or painting. I’ve experimented with a few different apps, but I like to approach the learning of any new skill by trying to grasp the basics so in the end I opted for the simplest one I could find, Mobile Sketch, which does seem to do most of the things a more sophisticated app will offer without being too confusing. Since they all come without instructions and assume you know what things like layers are, and what they’re for, (I think no-one who designs these things can actually bring themselves to believe that there are still people like me on the planet, who didn’t grow up almost permanently attached to one electronic device or another) I’ve had to discover what’s possible by just splashing around and experimenting – which isn’t a bad way of learning. If I pursue it I’ll seek out tutorials on YouTube! The first thing I did after simply covering the screen with various different swooshes and speckles and colours of infill was to try a stylus rather than my finger, and found that with this simple app most styluses (stylii?) work OK, so I can draw in a way that is not too unresponsive. 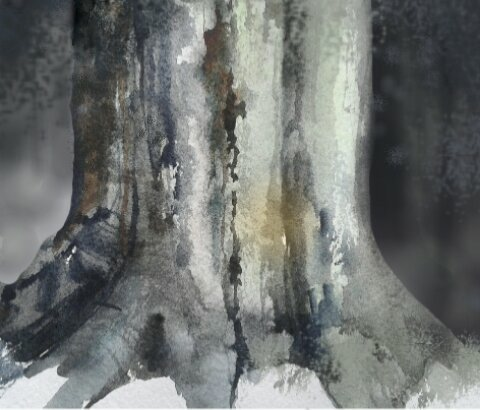 Finding this rather fun I then realised that I could edit and adapt and add to photos, so after entertaining myself adding the effect of mist and fog to some landscape photos, I imported a watercolour sketch of the trunk of a beech tree I had in my sketchbook and added a background to the plain white of the paper, which was easier than I’d thought. Saving the picture to the device (this is on a Samsung Galaxy tablet) seems to reduce the original jpeg to a much smaller png file, so the resolution is not all that great, and when I experimented today with a quick drawing of a glass vase done on my smartphone, the end result was the same – a very small file. This doesn’t matter for the time being as I’m only keeping anything I do like this as a kind of digital sketchbook for now, but nevertheless it’s something I want to understand more about. There’s no point in pushing a medium to do something it’s simply not able to do all that well, so I’m not trying to replicate the kind of drawings I’d do if I were holding a pencil or a brush. I’m interested to see what I can do on my tablet and phone that I couldn’t do in a sketchbook. I’ve been looking at all sorts of digital art and admiring what some people do – there’s some incredible work out there and the best digital art looks like just that, good digital art, not pretending to be a watercolour or a pastel or an oil – but I’ve also seen a lot that seems a bit lazy and predictable. Drawing, for me, is always about recording, exploring and learning, so that’s what I want to use this digital thing for – another new tool, new skills, new possibilities.